Hungary's PM Viktor Orban has accused the EU of "insulting" his country, as its parliament began considering disciplinary action against Hungary. MEPs are debating whether his right-wing government's policies on issues like migrants pose a threat to the EU. It comes just months after the European Commission took the step of launching similar proceedings against Poland. However, this is the first time parliament has tried to use the power, known as Article 7. Dutch MEP Judith Sargentini, who wrote a report into Hungary and Mr Orban's Fidesz party, launched the debate. She said her report "comprehensively lists" attacks on the media, minorities, and the rule of law, that represent "a clear breach of the values of our union". 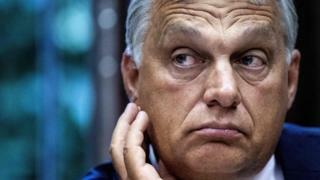 Hungarian Prime Minister Viktor Orban arrived late to the proceedings before launching a blistering attack on the EU and Ms Sargentini's report. He denounced it as an "abuse of power", and said it contained 37 "serious factual misrepresentations". "You think you know better than Hungarians themselves", he said, and vowed that Hungary "will not accede to this blackmail". Liberal MEP and former Belgian Prime Minister Guy Verhofstadt attacked Mr Orban, saying he was not his country and that Hungary was "far more eternal than you are". Mr Verhofstadt also said it would be "impossible today" for Hungary to join the EU "under these circumstances". But the MEP and former leader of the right-wing, Eurosceptic party UKIP Nigel Farage said both Mr Orban and his country had been insulted. "Come join the Brexit club, you'll love it," he said. Eurosceptic Mr Orban was re-elected earlier this year after campaigning on an anti-immigration platform, with Fidesz winning two-thirds of parliamentary seats. But while he has support at home, critics in the European Parliament say his policies are evidence he does not respect the values of the EU. A committee of MEPs points to the Hungarian government's approach to migration - including a new law which criminalises lawyers and activists who help asylum seekers - as well as media, the courts and universities as proof. However, in order for any sort of disciplinary proceedings to go ahead, it needs the backing of two-thirds of MEPs - and it is not clear which way the vote, due to take place on Wednesday, will fall. If MEPs do decide to support the process, which could end up with Hungary being monitored by Brussels, it may be a very slow process. The European Commission took the unprecedented step against Poland in December 2017, giving it three months to address concerns that its judicial reforms threatened the rule of law. However, there is still very little sign that a conclusion is coming, BBC Brussels reporter Adam Fleming says.